Show your UU pride in all kinds of weather with this sturdy, push button to open, chalice umbrella. Show your UU pride in all kinds of weather with this compact chalice umbrella! Features an auto open button, ergonomic rubber handle, wrist strap, and matching sleeve. 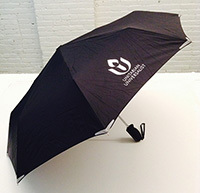 This super-sturdy umbrella features the chalice on a black background.